Monday Memory - "Money Allotted for New Buildings"
In late 1945 a new campus school was proposed. In early 1946 initial funding was secured. Delays pushed the project off until early 1947 when increases in material costs meant the need for additional funding. 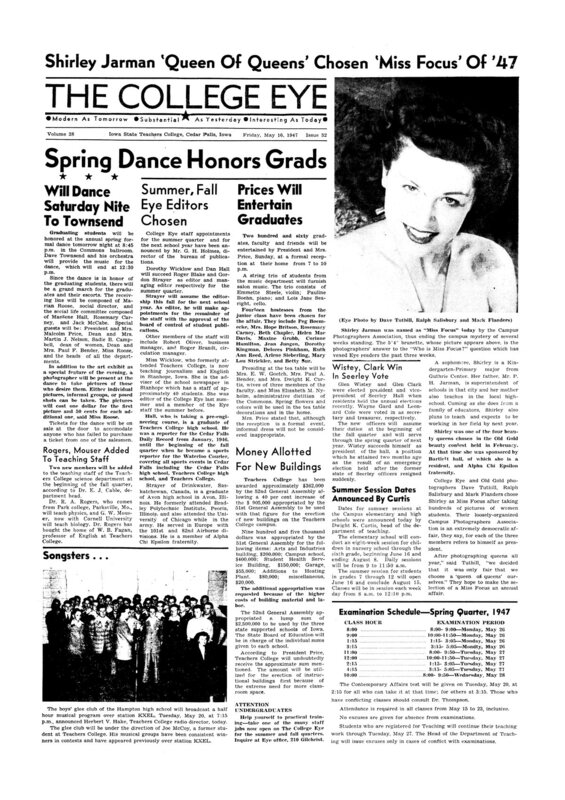 It would be May of 1947 before the Iowa General Assembly would approve the new appropriation for the college's construction projects as we can see in this article from the May 16, 1947 issue of "The College Eye"
While technically the General Assembly approved a lump sum funding for the State Department of Education to disperse to the state run colleges, President Price was confident the Teachers College would receive the allocation they had requested. This is part 3 in the ongoing story of construction of the Price Laboratory School. Read Part 1: "New Construction Projects Planned"
Read Part 2: "A 1 Year Delay"